The sun sets behind the Sicilian mountains looming beyond the Strait of Messina. The water is calm, interrupted only by small sailing boats and a colossal metallic ship anchored between the port and the sunset. Hundreds of refugees are waiting on board, their silhouettes clearly marked by the sun behind them. We are in Reggio Calabria, a small port city of about 200,000 residents in mainland southern Italy, at the other end of the strait. For the past couple of years, this ancient city — once home to Greek, Roman and Byzantine civilizations — has seen a different kind of cultural influx. Thousands of refugees searching for better lives have arrived after crossing the Mediterranean in perilous conditions. This exodus has become part of the biggest wave of global migration since World War II. Over 220 refugees wait to step on Italian soil. Earlier that day, they were rescued by a Singaporean ship managed by the Danish shipping company TORM A/S. At the port, two worlds — once divided by the sea — meet. On one side, refugees stare curiously from the ship at those on land. Some are afraid. Some seem exhausted. Others are smiling shyly, excited to finally be so close to stepping on Italian soil, unaware of all the complications they will likely face as they try to build new lives in Europe. On the other side, dozens of men and women are preparing for the arrival of yet another group of refugees. There are doctors, immigration officers, volunteers, Italian police forces and the Protezione Civile (the equivalent of the American National Guard). They have witnessed hundreds of sbarchi, as the landings are known in Italian and the procedure has become ritual, particularly in the summer months when the weather is ideal for traveling. During this season, as many as three landings with thousands of refugees take place per week in Reggio Calabria. 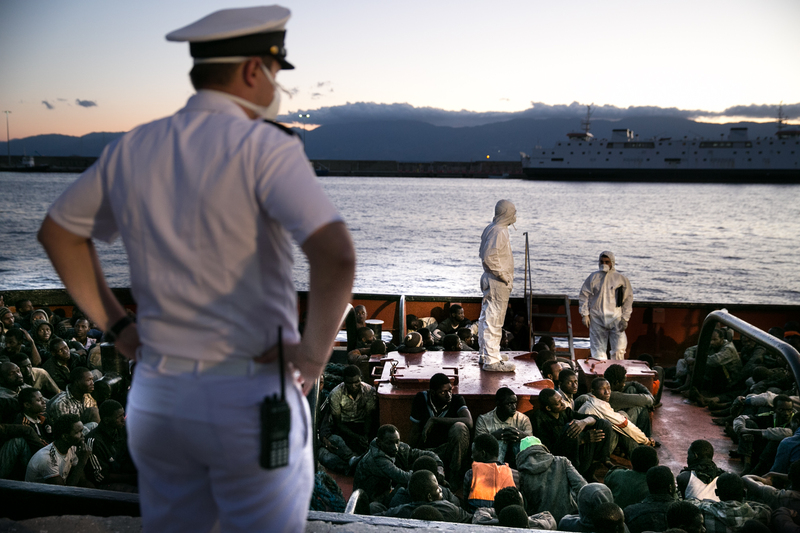 The day before, the German navy rescued 627 refugees — including 115 women and 41 children — near the Libyan Coast and brought them to the Italian port. 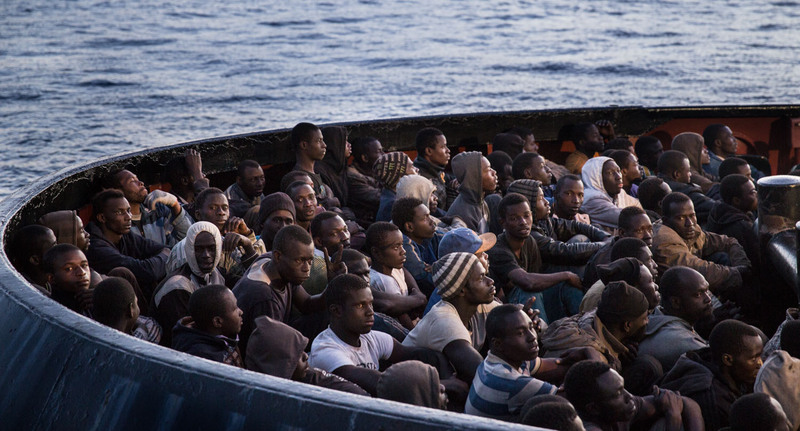 Most came from Eritrea in East Africa, but Syrians, Nigerians and Gambians were also among the rescued. The refugees had something in common. All were fleeing war-torn nations, poverty or political oppression — which has driven nearly 60 million people from their homes all over the world. For refugees from West Africa to South Asia, the Mediterranean has become the preferred route to reach Europe. In 2015 alone, over one million people crossed the Mediterranean Sea, according to the the United Nations Refugee Agency. That is more than four times the number of refugees that crossed the sea in 2014 and more than seventeen times the number that crossed in 2013. The Mediterranean is the deadliest migration route in the world — more than 3,700 people died attempting the crossing in 2015 and 410 more deaths or missing persons have already been reported as of mid-February 2016. Italy saw an abrupt influx of refugees from North Africa when Colonel Muammar Gaddafi's regime was overthrown in 2011 by opposition forces. Shortly after the revolution, a brutal civil war threw Libya into political chaos, allowing networks of human trafficking to thrive that enticed refugees to travel to Europe from the North African country. Since then, the number of refugees who seek safety in Europe has spiked. Different countries produce different kind of refugees. West Africans flee poverty and conflict, Eritreans an oppressive regime and Syrians a brutal civil war. Even refugees from nations in South Asia, like Pakistan and Bangladesh, have made the trip to Europe. There are three main migration routes in the Mediterranean Sea. Until 2014, the most popular one was the Central Mediterranean route, which connects Libya to Italy and Malta. In 2015, however, the number of crossings through the Eastern Mediterranean route — connecting Turkey to Greece — has increased more than seventeen times, largely due to Syria’s civil war. 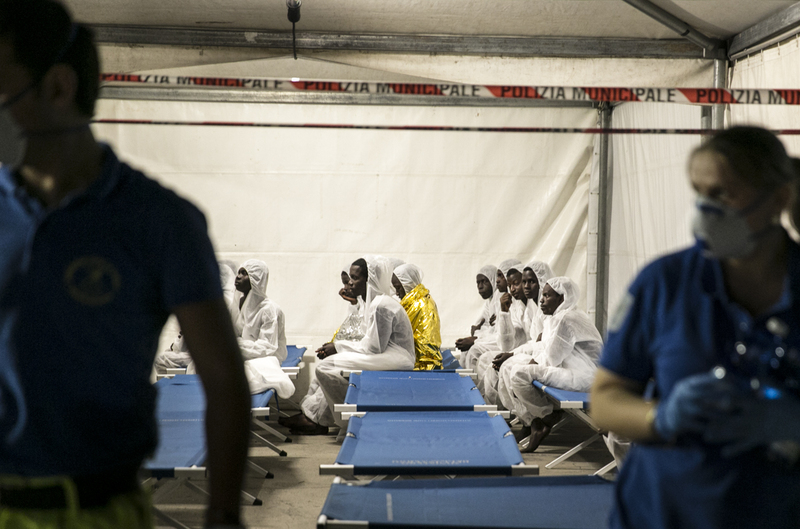 A group of refugees mostly from West Africa wait in line for a medical examination after disembarking from a rescue ship at the port of Reggio Calabria. Refugees typically go through a medical check-up as soon as they arrive to the port. Doctors often look for signs of scabies and other infectious diseases that are common in overcrowded conditions, like the small boats in which people travel. A lot of refugees travel barefoot, which often results in injuries in their feet. Those who don’t have shoes are provided with a pair once they land. Local authorities, doctors and volunteers from religious and service organizations stand at the port waiting for refugees and migrants to arrive. They proved medical services, as well as food and clothing for those who need it. In 2013, in response to numerous shipwrecks, the Italian government launched a rescue operation known as Mare Nostrum, “Our Sea” in Latin, which the U.N. reported saved hundreds of thousands of lives. Though the program was largely funded by the EU, the Italian government managed it and it proved to be unsustainable. In 2014, Mare Nostrum ended and was replaced by Operation Triton, funded by the European Union. Operation Triton is the most recent rescue plan put in place by Frontex, the EU’s border control agency. The EU agreed to fund rescue operations and use ships like the one operated by the German navy that afternoon in Reggio Calabria. Refugees rescued crossing the central Mediterranean route are brought to Italian ports for processing by local authorities, regardless of the nationality of the rescue ship. As soon as the ship arrives to the port, Italian authorities look for the captain or captains of the boat, who are taken to the police to be interrogated. Slowly, the rest of the refugees start lining up and make their way out of the ship. Once on land, doctors and volunteers wearing full body protective suits are waiting for them to complete medical checkups and direct those who are sick to medical tents for further inspection. Precaution is necessary, as it is not uncommon to see migrants with scabies and other diseases common when being in closed quarters. Unaccompanied minors, also known as UAMs, are also separated from the rest. This particular group of refugees has grown dramatically in the last couple of years. Italy has received UAMs from Eritrea, Somalia and Gambia. After receiving a medical examination, refugees with scabies and other contagious diseases are separated from the group. They wait until they are taken to temporary refugee centers. Those who are not sick or UAMs are sent on buses to northern Italy where there is better infrastructure to receive such a massive influx. Typically, this means that most refugees end up in larger cities like Rome, Florence or Milan. Many are unwilling to stay in Italy because unemployment is high and protection programs are better in northern Europe. Reggio Calabria is one of the major reception points for refugees in Italy. Cities like Palermo, Messina and Catania in Sicily have seen a similar influx. The southern Italian island of Lampedusa, which is closer to the Libyan Coast than to mainland Italy, has also been a major entry point to Europe for thousands of refugees. As foreign journalists, we stood at the port, unsure of how to make sense of what felt like a surreal and dystopian scene, strangely antiquated and colonial. The Mediterranean refugee crisis has been taking place for years, but only now, with a dramatic spike in numbers and thousands of people drowning in the Mediterranean, has the situation stirred public outrage. Enough pressure has mounted to move politicians to work on more urgent and responsible policies, after years of inaction. Refugees who have been diagnosed with scabies or other infectious diseases are taken in buses to refugee centers in the city, where they receive medical treatment until they recover. Those on the ground feel the results of political stagnation when local authorities and citizens face the tangible consequences and the chaos that comes with refugee landings. The system currently in place is meant to process as many people as possible in the least amount of time, inevitably resulting in what feels like an inhumane scene. Moreover, this translates into understaffed teams, cultural insensitivity and lack of basic infrastructure that is necessary to deal with a crisis of this scale. For example, even though Eritreans are one of the biggest group of refugees arriving in Italy every year, there are no translators of Tigrigna, the primary Eritrean language. After long hours of medical examination, refugees continue their journey. Those who stay behind are sent to temporary refugee centers in Reggio Calabria, where they wait until they recover. Minors stay under the protection of the government, until they turn 18. Whether they stay in the city or continue their journey north, all refugees try to answer what finding a better life really means. After medical examination, the Italian government takes healthy refugees to bigger Italian cities like Milan and Rome, where there are better infrastructures to receive them. A temporary refugee center is located at an unused school gym. Centers like this one are overcrowded and lack adequate living conditions. An Eritrean unaccompanied girl waits at the center until her family makes arrangements to reunite with them in Northern Europe. There are concerns among local authorities that young girls may be forced into prostitution networks. Eritrean refugees write down phone numbers of relatives and friends already living in Europe to make travel arrangements and join them. Most refugees have networks in Europe.